Summary: This is how a family keeps a secret…and how that secret ends up keeping them. 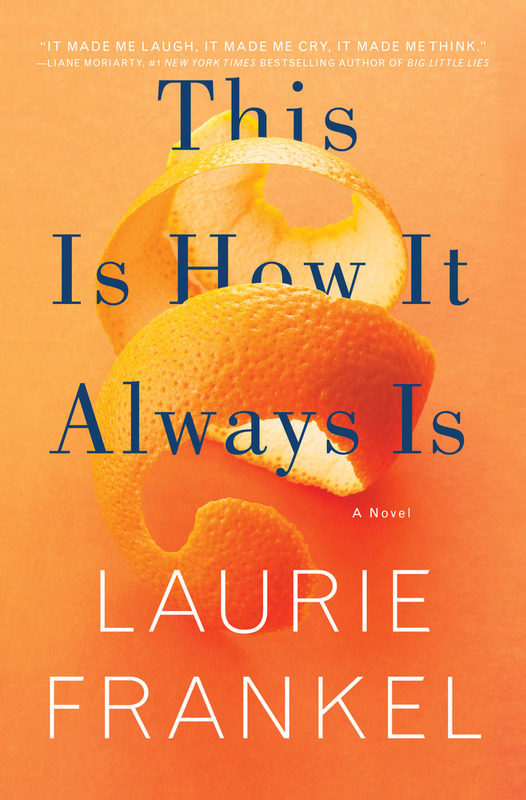 THIS IS HOW IT ALWAYS IS by Laurie Frankel is a book that, frankly, surprised me... in all the best ways. I had heard some buzz about this novel at SIBA (and truthfully, even before that! ), and I was assured that the book would make me think -- and think I did. However, THIS IS HOW IT ALWAYS IS made me feel too. I don't think you can ask much more from a book than that! THIS IS HOW IT ALWAYS IS tells the story of one very big family who has an even bigger secret. Rosie and Penn are the parents of four rambunctious boys. Of course, it's natural that they would like a little girl; however, they decide to have one more child -- truly not caring if it's another boy. Well, guess what? It's another boy they name Claude. However, Claude knows from a very young age that he wants to be a girl. Rosie and Penn (and even his four bring brothers) are all extremely supportive, but the rest of the community... not so much. They decided to move to the more progressive Seattle area and just introduce Claude as Poppy. Through the next few years, the family has the normal issues that all families have; however, Poppy has made friends and seems happy. That is, until her "secret" is eventually revealed, and everything comes crashing down for Poppy and the rest of her family. I couldn't put down THIS IS HOW IT ALWAYS IS. I was drawn into this family's story from the first few pages, and I became more and more caught up in their lives (and lies). THIS IS HOW IT ALWAYS IS is a big book -- almost 400 pages; however, I think I read it in just a little over two days. I found these characters to be very real and I couldn't help but care so much about all of them. I think this is a major testament to the author's ability to bring this story to life. And maybe that's because Ms. Frankel wrote what she knew. Ms. Frankel's adopted child is transgender, and I believe her parenting has made her the exact right person to tell this story. She wrote with a sense of compassion and understanding that, at times, brought tears to my eyes. I loved how supportive Poppy's parents were and just how much they were willing to sacrifice to make her happy. There are a few lessons in this novel for all parents! Ms. Frankel did a few other neat things with this novel besides having a great premise. For example, the father was a writer who loved to tell bedtime stories to his kids. He actually created a long-running fairy tale to help Poppy and her brothers to deal with their issues. This fairy tale had characters and storylines that were symbolic of what was going on in Poppy's life, and it was definitely interesting to see how she interpreted the tales... especially as she got older. It probably goes without saying that THIS IS HOW IT ALWAYS IS would make an outstanding book club selection, especially for readers who are also parents. There is a reading guide available with seventeen questions. Some of the themes you might want to explore include gender identity, parenting, sacrifice, forgiveness, secrets, bravery, acceptance, guilt, and gender stereotypes. Overall, I thoroughly enjoyed THIS IS HOW IT ALWAYS IS and I highly recommend it to fans of literary fiction. I thought this book was terrific too. Before I read it, I didn't understand how a young child could have feelings like that, but this book made me understand it. I really want to read this book. And I agree that this would likely make a great discussion book. Hopefully, the discussion could be civil, but that's up to the moderator. Really makes you think 'what would I do if...'. Nice review! I've seen this one mentioned before but didn't have much interest in it....until I read your review! I'm adding it to my list now. Thanks!